We should first establish a meaningful scale and appropriate units for energy storage. Any household will use energy at a certain average rate, or power. The average American household (of which there are about 115 million) uses 30 kWh per day of electricity—equivalent to 1.25 kW average power. Additionally, the average American household uses 35 kWh of natural gas energy per day, generally for heating applications (natural gas is usually billed per Therm, which is 29.3 kWh). Substantial variation can exist in these numbers in any given house. For example, my wife and I use an average of 10 kWh/day in our house for electrical and natural gas energy combined, in roughly equal measure. Storage requirements will therefore vary according to usage. Conversely, the same storage will last longer in some houses compared to others. We will restrict our attention in this post to storing enough energy to cover electrical usage only. For off-grid applications, the rule of thumb is to have enough storage for three days of zero input. Not to be taken literally, this is effectively the same as 4 consecutive days at 25% of break-even, or 6 days at 50% of break-even—in each case running a deficit of 3 days. The spirit of this post is to establish storage independence within a home, rather than rely on external infrastructure to do it for you. To the extent that you want to rely on the outside world to provide for you, the targets established here can be scaled down accordingly. The ideas explored here are plausible options that might come to mind first in a “why couldn’t we just…” sense. Since we are trying to fit a storage solution into a home, let’s allocate a fixed volume for each of the solutions. A reasonable choice would be one bedroom-sized space. Let’s say it’s 3 m on a side, and 2.5 m tall (about 10 by 10 feet, 8 feet tall). The total volume envelope is then 22.5 m³. Since we are comparing to batteries, let’s establish a reference case. Batteries are characterized by how many amp-hours they can generate. A 100 A-h battery can put out 1 A of current for 100 hours, or 10 A for 10 hours, for instance (though the rating typically declines for high currents). The electrical power exerted by the battery is just the current times the voltage. So a 12 V battery putting out 2 A is delivering 12×2 = 24 W of power. If rated at 100 A-h, this battery would go for (100 A-h)/(2 A) = 50 hours, producing (24 W)×(50 h) = 1200 W-h, or 1.2 kWh of energy. A rechargeable AA battery holds about 2300 mA-h (2.3 A-h) of charge, which at 1.3 V turns into 3 W-h of energy. 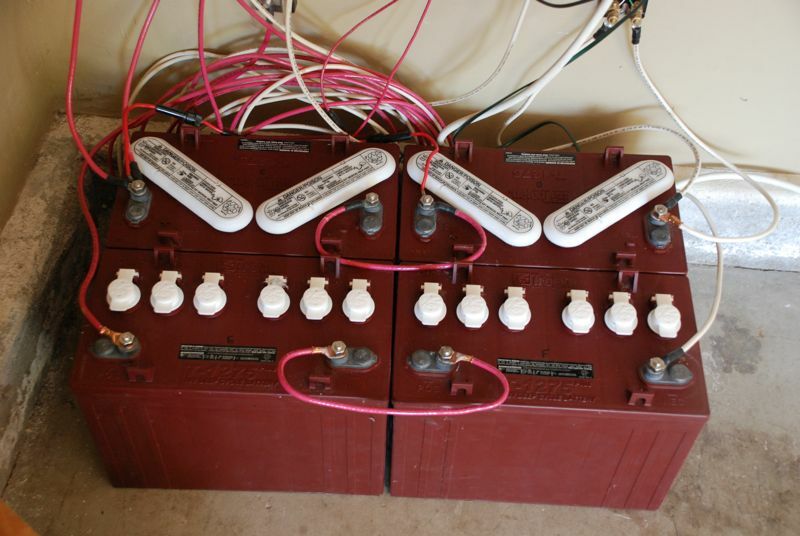 Four golf-cart batteries used in my off-grid home PV system. Each is 12 V, 150 A-h, thus 1.8 kWh of storage apiece. As detailed in the Nation Sized Battery post, large lead-acid batteries occupy 13 liters (0.013 m³) of volume, and 25 kg of mass per kWh of storage. Practically speaking, we would not fill 100% of a bedroom’s volume with batteries, because we need physical access for maintenance/replacement. If we filled 10 m³ of the available volume with actual battery, we would end up with about 750 kWh of storage, and a mass of 19 tons (better reinforce the floor!). This bank would provide about 25 days of storage for the average American electricity demand. The lesson is that batteries are a can-do solution in terms of fitting into a house envelope. A more practical few-days of storage is that much easier. Although at approximately $150 per kWh of storage, three days of storage for the average American house will cost about $15,000 to cover electricity demand, with the cost recurring every five years or so. But let’s not worry our pretty little heads over mere economic concerns at the moment. Since lead-acid batteries require monthly equalization and topping-off with water, have a limited number of deep cycles (500–1000 typically), and do not tolerate extended periods at low charge, it would be nice to identify better options. Hydroelectric dams and pumped storage solutions rely on the gravitational energy stored in an elevated mass. What could we do in a home environment? Could we get much out of our personal pumped storage tank on-site? Let’s start small by considering the 3 W-h of energy stored in a AA battery, as computed above. One kWh of energy is 3.6×106 J of energy, so our AA battery stores 10,800 J of energy. A mass of m kilograms, hoisted h meters high against gravity at g≈10 m/s² corresponds to E = mgh Joules of energy. If we were willing to hoist a mass 3 m high, how much mass would we need to replace the AA battery? Have a guess? The answer is 360 kg, or about 800 lb. A battery the size of your pinky finger beats the proverbial 800 lb gorilla lifted onto your roof! The lesson is that gravitational storage is incredibly weak. A volume of water the size of our bedroom raised even 10 m above our home in a precarious threat to the neighbors would store 0.625 kWh. That’s enough for 30 minutes of typical household electricity consumption. You’ll forgive me if I ignore efficiency losses. It’s not even worth the effort. It’s over. Let’s put a massive spinning disk in our energy-storage “bedroom.” These might end up being popular in Malibu, as the gyroscopic stability inherent in the spun-up system could be very handy in a mudslide—keeping the house level on its way down the hill, mimicking the surfers it’s been watching all these years. The kinetic energy stored in the rotation of a cylindrical-shaped solid disk is ¼mv², where m is the mass of the spinning cylinder and v is the velocity at the outer edge. For a fixed mass, it is better to put as much of the mass as possible on the outer edge, in a hollow cylinder (supported by spokes, for instance), which can deliver a factor of two more energy per mass. But in the case where space, not mass, is the constraint, the solid disk has more mass than the hollow version would, making it a net win to just go solid. How big do we make this thing? Let’s give it a diameter of 2.5 m and a height of 2 m (need room for mounting, and surrounding container/structure) yielding a 10 m³ volume. At the density of steel—about 8× that of water—we get 80 tons (now even more important to reinforce that floor!). How fast do we spin it up? Let’s pick the speed of sound—345 m/s—and see where that puts us. Go big, or go home! We get 2.4 GJ, or about 650 kWh of energy stored in this scary flywheel. That’s somewhat comparable to a similar volume of lead-acid batteries (though four times as massive). We would want to evacuate the air around the spinning disk or we will suffer a drain rate of something like 1 kW (consuming 24 kWh/day just to keep it spinning; the room would also get warm-ish). The acceleration at the outer radius is about 10,000 times that of gravity, and it turns out the geometry and speed we picked indeed approaches the yield strength of steel. Structural weaknesses then risk breakup, which would dump the unwelcome energy equivalent of half a ton of TNT in your house. We would need to slow to a speed of 250 m/s at the outer rim to provide an adequate material safety factor, resulting in 250 kWh of storage. Another safety concern: if the flywheel comes off its support, it could barrel through the neighborhood, popping through houses like they weren’t even there. Not ideal in earthquake country. Obviously, we can afford to scale things down a bit, since our first cut provided three weeks of storage capacity. The same cylinder spinning at 125 m/s (275 m.p.h.) at the edge gives about 90 kWh of storage, and may be somewhat more tolerable from a safety point of view. Scaling down the size/mass in addition to velocity begins to result in a less useful storage solution for the average house. If you’re going to go through the effort, expense, and sacrifice of space for a scary flywheel, you’d better feel like it provides enough energy storage to be worthwhile. A recent $53 million flywheel storage facility in Pennsylvania uses 200 large units storing 25 kWh each, working out to $10,000 per kWh of storage capacity. Each unit’s vacuum chamber looks to be about 1.5 m in diameter and 3–4 m tall. If we raise the ceiling and squeeze four into our bedroom, we could get 3 days of electricity storage for the typical American house for a cool million bucks. But the frictional losses—while painstakingly minimized—likely preclude these units from being useful over periods of days. We could store energy in something akin to a spring by compressing air. A high-quality tank can store air at 200 atmospheres of pressure. If we make a big bedroom-sized tank in cylindrical form similar to the flywheel dimensions, it has a volume of 10 m³. The steel walls would have to be about 6 cm thick to withstand the stress, so that the tank would have a mass of approximately 12 tons. You did reinforce the floor, right? We want to take a volume of air, V0, 200 times larger than our tank volume at atmospheric pressure (P0 = 105 Pa) and compress it to fit in the tank (adding two tons of mass!). If done slowly enough to maintain approximately constant temperature (several hours), the energy required is P0V0ln(P/P0), where ln() is the natural logarithm function. For our volume, this turns into 1 GJ, or almost 300 kWh—enough for 10 days of typical American electricity use. So we could get away with a smaller tank or simply charge it to a less extreme pressure. The efficiency for compressing the air and later turning a turbine for electricity generation may be less than what one might find for a flywheel. The storage itself is not the hard part. I could go out today and get some lab-sized cylinders (~50 liters), which could store 1.5 kWh each—about like a golf-cart battery, although heavier and bulkier. But I would have a very difficult time arranging an efficient pumping and extraction/turbine system. If not for that, I would find compressed air to be an attractive system compared to batteries: minimal maintenance; no apparent cycle limitations, reasonably low-tech, and perfectly tolerant of remaining at low charge indefinitely. Laboratories that frequently use compressed gas cylinders have strict safety protocols to prevent explosions from structural rupture due to mishandling. If houses across the land had high pressure vessels in various states of neglect/corrosion, we’d get the occasional boom. I might worry about having a gun in the house. But I’m guessing that house fires would still represent a bigger net threat. What about electrolysis of water into hydrogen for later use either in fuel cells or combustion engines? I’ll ignore the combustion option, as the heat engine efficiency would be abysmal compared to the other storage options on the table. Batteries, gravitational storage, and flywheels can achieve better than 80% round-trip efficiency. Compressed air is harder for me to evaluate, lacking adequate knowledge on compression/extraction devices built for efficiency. Electrolysis for the production of hydrogen tends to range between 50–70% efficient. Then the fuel cell converts the stored energy back into electricity at 40–60% efficiency for a round-trip efficiency of 20–40%. If you happen to want some of the waste heat, then you might boost the efficiency estimate (true for any of these storage methods, actually). But in a straight-up apples-to-apples comparison, the hydrogen method is a very lossy storage option. If it were dirt cheap and low-tech, I might be more excited about its potential, despite the poor efficiency. But since the opposite is true, I’m not revved up over hydrogen storage. Have I exhausted all the possibilities? Certainly not. I picked obvious and representative techniques spanning gravitational, kinetic, spring force (in air), and chemical storage. These are the ideas that come to mind for me, each with some reasonable footprint in the panoply of relevant small-scale “solutions” often discussed. I stayed away from thermal storage because the round-trip efficiency will make hydrogen fuel cells look fabulous. I also stayed away from fossil fuels (gas generators, storing natural gas at home) for the obvious reason that we don’t generally need storage as long as we have a reliable supply of fossil fuels. A short digression to contrast the miraculous energy density in fossil fuels: our 3 days of electricity storage at 30 kWh/day requires just 12 gallons of gasoline (1.6 cubic feet; 45 liters) burned in a 20% efficient generator (it seems like the other 80% is noise!). The Earth’s battery—a one-time gift to us—turns out to be vastly superior to any of these other “solutions” in terms of energy density and long-term storage, measured in millions of years. It will be sorely missed when it’s gone. With the exception of the feeble gravitational storage example, each of the ideas presented here are technically challenging, expensive, and sometimes dangerous. I am left thinking that batteries look pretty good for home storage. And they already perform a key function in my household. But even the cheapest lead-acid solution is still expensive, high-maintenance, and requires replacement every few years. For $150, you get 1 kWh of storage. 500 cycles means 500 kWh of service (get about 1000 cycles if half-discharge, but still roughly the same total energy service). This comes to about $0.30/kWh, which makes it an expensive source of electricity. Even so, lead-acid is the most economic storage medium of choice for off-grid households, and loads better than no storage at all! For short-term outages, we might get by with storage for critical functions only, like refrigeration and cooking. In a renewable-energy future, where storage must fill a larger role, the solutions are not obvious. As explained in the post on a nation-sized battery, we can’t simply scale up our trusty lead-acid, lithium, or nickel-based batteries to satisfy our current demands in a fully-renewable energy scenario because of resource limitations. Large-scale pumped storage, subterranean (or underwater) compressed air, and sodium-sulfur batteries may become important players. But these don’t help the independent spirit who wants personal storage, and by now is perhaps feeling—well—powerless. Many of the difficulties explored here become immediately easier with a simple reduction of scale. Because my household only uses 5 kWh of electricity per day, the 7 kWh of lead-acid storage I have in the form of four golf-cart batteries is enough to provide a meaningful service. For me, the lesson is that adequate storage appears at first-blush to border on impossible under the current profile of consumption in the U.S. But cut consumption down by a factor of five or so, and I become optimistic. Such deep cuts are not impossible: I can personally still participate in a western lifestyle at a fifth of the energy cost at home. It’s a choice, and I’m happy with mine. This entry was posted in Energy Storage and tagged batteries, compressed-air, flywheels, fuel-cells, home-solutions by tmurphy. Bookmark the permalink. The compressed air option could be much more efficient for powering a refridgerator or air conditioner, as all these devices are are gas compressors. Why not just have a several-day supply of compressed freon (or whatever they’re using these days)? This would, of course, require that you modify your refridgerator and AC systems to use “central freon”, so I don’t know how workable this would be. and a 56.6% energy conversion at the motor shaft. so that giant room gives u 5 day supply. similarly if u dont using steal/non steal for the container “practical achievable energy densities… from 40 to 100 kJ/kg” or to 1-3 tons. seems reasonable to have a room the average bedroom size with a mass of 5 tons in the basement for a couple of days of power. Why not discuss the most common energy storage solution? Yourself. Manual labor to replace many of the functions, minimizing the actual need for reserve energies. Using http://en.wikipedia.org/wiki/Human-powered_equipment as a reference for some numbers, it seems like humans can output around 75 Watts average over the course of a day. This doesn’t include your thermal output, which is somewhere in the neighborhood of 100 Watts. So say you worked at that pace and were able to capture an optimistic 2/3 of the energy you expended, you might expect to recover 50 Watts * 8 hours= 400 Watt-hours (or 0.4 kWh or 1.44 MJ), so nothing spectacular. Plus you’d have to eat around twice your DRV of Calories (rounding a bit here) to do it. If you ate rice (which you can get at Costco at around $1 for 2.5 lbs), you’d need to consume around 7lbs to get 4000 Calories which comes out to $3 of rice, putting your price per kWh at around $7 just for food. And let’s not forget the opportunity cost of doing hard physical labor 8 hours a day), the price of equipment to harvest this energy, or even store it! I’m not saying that doing more work around the house is a bad idea, it’s just that human power is not a very good idea. I think you and Tom agree very much here, in that the best we can do is reduce our reliance on electrical power by changing our habits. Another way to think about it: a horsepower is about 750 Watts, or about 10x what you can do. A basic gasoline engine, with all its inefficiencies can easily output ~10 hp without issue (cheap sedans do ~100 hp), so human power is pitifully weak in comparison. Speaking of refrigerators and stored energy, the “old time” solution was to harvest ice from the local river or lake in the winter and store it in a cave or ice house. Maybe we can start making hybrid freon/ice boxes. Are freezers more efficient when they are packed full of ice? This strategy doesn’t work well in southern climates, however. In fact, it wasn’t until the advent of air conditioning that people even considered moving to the south. Speaking of cooling (although slightly OT): I always wonder why we aren’t using solar for direct cooling. Know those RV and camping fridges? They require a hot end, a medium temperature heat bath, and produce a cold end. No moving parts. Seems like all that would be needed is a parabolic mirror on the roof to make the hot end. Unfortunately I don’t know about the efficiency of the underlying process, but I find it hard to believe that it should be a lot worse than first burning fossil fuels or using PV to make electricity, and then running an AC with that. Again, tmurphy to the rescue? I wonder how many power outage instances are also accompanied by a natural gas outage? In cases where the power is out, but the natural gas isn’t, the most logical solution is to use a natural gas generator (or better yet, a natural gas fuel cell system of some sort, either with a reformer and WGS reactor or a direct natural gas fuel cell). I realize this isn’t a “storage” solution, but it is a viable way to ride out an outage. In fact, such installations exist in the gulf coast to ride out outages after hurricanes. Alternatively, you could consider a gasoline or diesel generator capable of providing the 30kWh/day of electricity (citing your average, though each household would need to tailor their needs for their usage and what they are willing to sacrifice). One gallon of diesel (including biodiesel) contains 35 kWh of energy. Assuming that a generator is 15% efficient, you would need just over 17 gallons of diesel on hand, which would fill a cube 16 inches on a side. For gasoline, you would need about 15.5 gallons. Keeping this fuel on hand isn’t particularly difficult. Every 4 weeks or so, use the stored fuel to fuel your vehicle and replace the stored fuel with fresh. I would choose diesel if I had a diesel vehicle for the lower volatility of the material. Plus the storage doubles as a backup supply for your vehicle in case you need to evacuate and fuel isn’t available (service stations not open / not pumping fuel, or lines so long it makes accessing the station not viable). I also realize that this energy storage alternative does not move “us” away from fossil fuels. However, it does provide a nice contrast to the article to illustrate how energy dense and cheap fossil fuels are, and thus what we have to compete with when developing alternatives. What do you think of the feasibility of hydrogen fuel cells for a commercial solar array away from major power grids? For example, a floating raft of solar panels offshore, perhaps with a hydrogen-powered barge to bring the hydrogen to shore, where it’s either sold as transportation fuel or converted to electricity and fed into the grid. This is something I’ve frequently pondered… it seems it has the benefit of being expandable more so than a land-based solar panel array, since you aren’t limited by the amount of land you can purchase, just by the number of rafts/solar panels you can attach together. Also, the water source is all around you for free. The major downsides I’ve come up with are the efficiency part (which I didn’t realize was quite as bad as you point out above), and the likely increase in the cost of solar panels as demand continues to rise (and rare earths continue to become rarer). Currently solar panels are made out of cast off silicon boles from the semi-conductor industry. Silicon used in computer chips has to be a really perfect single crystal. Even small flaws can render the entire bole useless from a chip-manufacturing POV. However, PVs don’t require as pure a source material, so PV manufacturers simply buy up the cast-off boles at a discount price; much like buying damaged.defective clothes from discount stores like Ross. However, since they bole manufacturers are trying to make much purer boles than are needed for PVs, the process they use is much more expensive than what is needed to make PVs. If a company was to start manufacturing low-purity boles specifically for PVs the cost would come down significantly without hurting efficiency. I am skeptical that the PV industry works on the waste stream. Maybe in the past, when PV was a minor industry. And what could be cheaper than accepting rejects, anyway: it would hardly matter how expensive the original (failed) process was if it’s junk to the chip folks. Maybe you’re right, but I’d want to dig first. An afterthought: multi-crystalline ingots, which dominate the silicon PV industry, are not produced by chip manufacturers (useless to them), so this only bolsters my sense that the PV industry stands alone in its silicon production, and is already enjoying efficiency optimization in this regard. Storms are more violent out in the ocean. The array would get torn up, dispersed, and even sunk frequently. Conservation is always easiest and cheapest. In a real disaster in our mild climate, probably the most important thing would be to keep food cold and perhaps a bit of light. Your typical Energy Star fridge uses about 1 kWh / day these days. So unplug EVERYTHING except your fridge. If you need a bit of lighting, 10W of lights should be plenty in an emergency, and you’ll only need it at night while you’re not sleeping – so lets say for 5 hours. 50 Wh – pretty piddly! LED flashlights will be even better. Let’s also not forget our new friends, the electric car. The Nissan LEAF can store about 20 kWh of electricity. With the right equipment to convert DC to AC, a Toyota Prius or Chevy Volt (or other hybrid) would also make a very nice generator with a lot of run time – and they would have their gas tank as backup. They also have the benefit of being a LOT cleaner than your typical generator and a LOT quieter, too! 10 years from now we’ll have lots of lightly used electric car batteries with perhaps 80% of their capacity remaining. So an old Nissan LEAF battery will be able to hold at least 16 kWh of electricity. Even half of one will be plenty for an emergency. It will also have less maintenance than a lead acid battery (no water to evaporate), is safer (no explosive gasses generated when charging), and weigh at least half as much as the lead acids. Great post, again. Did not realize that H2 fuel cell was such a bad idea. Granted not as bad as an ICE running on Gasoline. I assume you use a gas fired tankless water heater, otherwise I think you would have justification to keep a 5 foot tall, 3 foot wide stack of batteries in your basement as your power reserve. Heck, if you are keeping 40-50 gallons of water at 120F 24 hours a day, you could keep the same amount of battery space too. What make water so special? Other than islands (Iceland, Hawaii, etc) that can use easy geothermal and their surrounding water to make H2, I do not see hydrogen working out well on this planet due to the fact of it not accruing in natural pockets. That has always been the problem with gasoline (IMHO) it has to be made from crude oil. That is also the beauty of methane and coal. You can take it out of the ground and use it straight up. No processing involved. What do you think of nickel-iron batteries? Wikipedia says they can last 20 years, some of the suppliers claim more. I’m not selling them, just trying to evaluate. Have you tried calculating the cost of a high-temperature ceramic super-conductor spool? Liquid nitrogen isn’t all that expensive, it actually costs less than kool-aid. If you insulate the spool with aerogel, a vacuum, and a thermal reflective blanket, you’d only need to refill the LN2 once a month, or less. It wouldn’t be terribly more complex a system than a propane grill; at least not from the perspective of the end-user. Cuperate super-conductors are relatively inexpensive, and the newer sapphire micro-particle based ones promise to be even cheaper. They have functionally unlimited reusability, have almost no loss, incredible energy density, and are solid-state. A device the size of a standard water heater could provide three days worth of storage even at current average use levels. Isn’t that what is called an EMP weapon? If that ever quenches, either due to technical failure or because someone forgot to refill the LN2 all your electronics may be toast. At first glance I find that almost as scary as the flywheel rolling around the neighborhood, although I haven’t done the numbers. tmurphy to the rescue? Could you email me a spec on your battery system? I have PV too and have been wondering how to do just what you have done. You can get the general idea from the Physics Today, July 2008 article I wrote describing my initial system. I have expanded to eight 130 W panels, a beefy inverter, and four golf-cart batteries since writing the article, but it still should be a useful start. You can also get some performance specs of the current system here. Your installation of solar power brings up an interesting question: why aren’t Utilities more aggressive in deploying renewable energy? The principal author is D. Elliott. Highly recommended. Storing electric energy makes not much sense. You should store heat in a heat storage. Basically an isolated tank with you can bury in the garden. Thing of a big thermo mug. My therrmo mug can keep 1 liter of water hot for over 24 h. A begger vessel with the same insulation will peform better becaus ther is less surface per volume. Water can be stored up to 100C or use oil for even higher temperature. For cooling just store ice. The phase change from water to ice need a lot of energy. Again the ice can be stored for weeks in a well insulated tank. For the rest of the energy it makes sense to cut down consuption firts and then ue a storage. Maybe the pressurized air would not be to bad. In an underground tank weigth doesnt matter that much. Converting electricity to heat is actually quite efficient. Around 90%, I’d imagine. But converting heat into electricity domestically? That will only get you 20-40% efficiency. Thermal energy storage is very cheap, but it’s inefficiencies eat that savings right up. I did not mean store thermal and convert to electric energy, but to use the thermal energy directly. This will considerably reduce consumption of electric energy. Or use gas for heating, cooling and cooking that’s proven for camping and with a bottle of camping gas you can survive for a week. What about a more distributed solution? I.e. putting batteries in all appliances, varying in size based on their consumption and necessity. Such appliances might become popular if we move into an era of frequent power cuts. Prius as a back up. How about some storage for that unusual event in gasoline delivered via a tool that you can use for other things. to over and under charging makes them very attractive for home energy systems. I bought mine from Beutilityfree for about 10,000$. 310 amp hours at 48 volts. There is a manufacturer of nickel-iron batteries in Montana. Those of us who live off-grid are well aware of the total cost of electricity. I figure that at our house it costs around $0.75 to $1.00 per kWh, so we don’t use much, about 3 kWh per day. We use propane for cooking, solar thermal for water heating, and wood for what little space heating we need. We could easily use wood for all heating loads and plan to gradually move in that direction, but what we have now has been more than enough to raise our children, who never noticed any significant difference between our house and those of their friends who were on the grid. While electricity is not essential for life, it provides a few luxuries, particularly lighting, that add quality to one’s day. I would like to be able to have a little available, even when that day comes when most folks are doing without. PV modules and copper wire last for a long time and DC light bulbs can be stockpiled. The weak link in a PV system is the battery, which in the case of lead-acid, will need replacing every 5-10 years, depending on type and cycle depth. Even so, as your post indicates, lead acid batteries are still the most cost effective solution for a few day’s storage of electricity. In theory, all the lead in a battery is completely recyclable into a new battery, though that is not now a function a typical home owner can manage. It might be possible for a well equipped off-grid homeowner to recycle lead if they used only pure lead batteries. Solar PV would be a perfect means of producing the energy of formation for a pure lead Plante plate. Poor Plante had to use primary batteries to provide the current to form his plates. He would have swooned over PV. I am curious if any of your readers have any background in actually making a Plante plate lead acid battery, or even have any leads to technical documents that would be helpful. I haven’t found much on the web and I already have Vinal’s book, which is the “bible” for lead acid batteries, but even that doesn’t get specific enough about how to make a Plante plate battery. There are two missing energy storage options here. 1) Ammonia: Advances in ammonia synthesis and storage technology are looking to become viable as a liquid fuel replacement for ICEs and as H2 storage medium for fuel cells. Ammonia synthesis plants can be installed in situ at ‘stranded wind’ sites where windmills can be located for best performance. The liquid ammonia can be piped or tankered away periodically. 2) Dimethyl Ether: A putative replacement for diesel fuel. Can be synthesised from biomass. Very interesting and instructive article. The saddest part is probably that even if household consumption could be reduced by a factor of five, the overall energy consumption would not be reduced by nearly as much. As a rough estimate, I think that the total electricity consumption would fall by less than 25%. How about natural gas storage? If you were to have a natural gas compressor to fill a car, you might also connect it to a storage unit. If you then had a combined heat and power co-generator (CHP), you could hypothetically store plenty of energy for weeks. Combine that with an uninteruptable power supply, with the CHP kicking on only periodically to recharge it, you could really have a good thing going there. I have also thought this idea has some appeal: already piped to your home, can keep you warm, cooking, and with hot water in any case. Then a generator gives a means for electricity. May be a good option for the short term (if there are not laws against it, which could be an issue). Long term it would be nice to have non-fossil solutions. But they’re so good at storing energy it just highlights how hard it will be to do without them. Nice stroke to couple to UPS, since most house power just sips energy most of the time (especially in reduced outage mode), and a full time generator would be wasteful—not to mention annoying.